Scientists in the UK say they have techniques for wave energy developers to more accurately measure and predict the conditions within wave energy test sites. The researchers deployed wave measurement buoys and used wave modelling to show how variations in wave size and strength could be resolved. The results will aid developers to better predict sea conditions within wave energy test sites, which is the crucial factor determining how much energy can be produced. 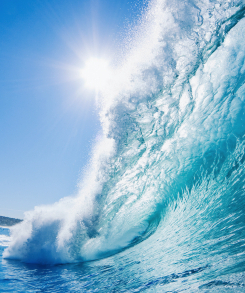 This study is part of ongoing research into wave-power as a renewable energy source. The experimental methods are now being applied to wave energy test sites in Cornwall, where several industrial bodies are trialling new designs. The Cornwall site may be the hub of wave power development, allowing up to three devices to be deployed concurrently and aiming to provide a fast, flexible low cost solution for the testing of wave energy technologies, components, moorings and deployment procedures. The research has been co-authored by Dr Ian Ashton and Dr Lars Johanning, both from the Renewable Energy department based at the University of Exeter's Penryn Campus in Cornwall and was supported by the National Environmental Research Council (NERC) Flowbec project.